Morning sickness has nothing on the tennis champ, who rose to victory during the early stages of her pregnancy. Consider us officially impressed. File this under "further proof pregnant women can do anything": Serena Williams announced she's 20 weeks pregnant in a Snapchat post yesterday—and while the post itself is no longer available, her rep has confirmed the news. We've done the math, and since the athlete is halfway through her pregnancy already, we learned one thing: Serena was pregnant when she won the Australian Open. This news is crazy impressive. 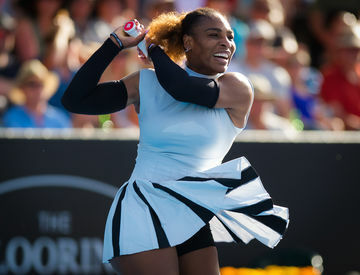 Not because we'd expect pregnancy to slow down one of the greatest athletes of our time, but because Serena was able to power through possible morning sickness, exhaustion and general first-trimester issues to compete at the highest level. Competition at a match like this is tight, and the fact that Serena won the Open doesn't just mean she beat out her competitors—it also means she competed to the best of her ability, and that goes to show a thing like pregnancy can't limit a woman's abilities. Serena is a world-class athlete, and what she'll be able to to do before, during and after pregnancy isn't typical. But tennis isn't just a sport for Serena, it's also her job—and while we won't all have the energy to practice a sport at this level during pregnancy, we can look to Serena as an example of someone who continued to crush it at her job while carrying a baby. Serena, who is engaged to Reddit co-founder Alexis Ohanian, has 20 or so more weeks of pregnancy left, and we can't wait to see what else she'll accomplish during that time. If initial evidence is any indication, pregnancy won't be slowing down this powerhouse.